Doctors may perform a brain MRI on patients presenting with symptoms that they cannot explain by other known conditions. Common symptoms leading to a brain MRI include headaches, vision problems, hearing loss, speech difficulties, muscle weakness, numbness and tingling, as described by MedLine Plus and the National Institutes of Health. 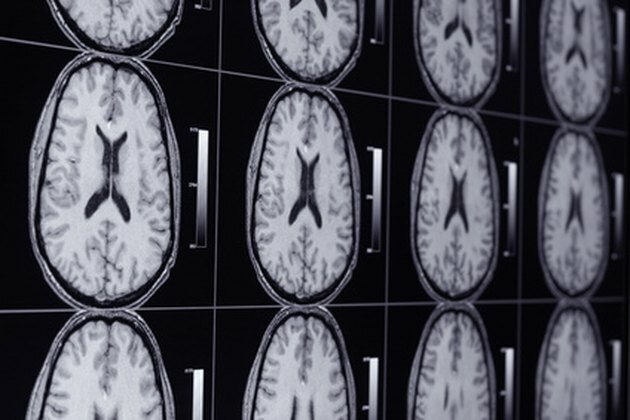 Although doctors may choose to perform other tests, such as a cranial computed tomography scan or a positron emission tomography scan of the brain, the level of detail provided by the MRI helps to positively find and diagnose an abnormality in the brain. Vascular abnormalities in the brain, meaning abnormal findings involving the arteries or veins, can lead to life-threatening conditions. A brain MRI can detect a blockage in one of the blood vessels in the brain that can deprive the brain of blood and oxygen, therefore leading to a stroke. A brain MRI can also detect abnormal bleeding in the brain. Abnormal bleeding may occur due to an arteriovenous malformation (AVM), a condition present at birth that causes the arteries and veins to tangle. Although present in less than 1 percent of the general population, according to the American Stroke Association, AVM can cause seizures, pain and impairments in movement, speech or vision. A brain lesion describes an abnormal area of tissue in the brain, as reported on the Mayo Clinic website. Although a brain lesion found on an MRI, especially an MRI performed for another unrelated reason, may indicate a previously resolved problem, it could signal a chronic or life-threatening condition. Multiple sclerosis, an autoimmune disease caused by the breakdown of myelin—the fatty substance surrounding nerves—leading to nerve damage, can cause brain lesions detectable by MRI. A brain lesion may also occur due to an infection, known as encephalitis, or a brain tumor. Cells in the brain can grow abnormally, leading to the formation of a tumor. A brain tumor may be either benign, meaning it fails to invade nearby tissues, or cancerous, which does invade healthy tissue. A brain MRI can reveal the presence of a tumor and provide information on the location and size to help doctors determine follow-up care. Upon receiving the news of an abnormal brain MRI, the doctor will likely perform additional testing. If additional symptoms lead the doctor to suspect multiple sclerosis, he may perform another brain MRI in three months, according to the American Academy of Family Physicians, to detect the presence of new lesions. An abnormal result leading to a diagnosis of a brain tumor may be followed by a biopsy, in which a doctor removes a sample of the tissue to determine the type of tumor. American Stroke Association: What is an Arteriovenous Malformation? What Brain Disorders Does an MRI Detect?